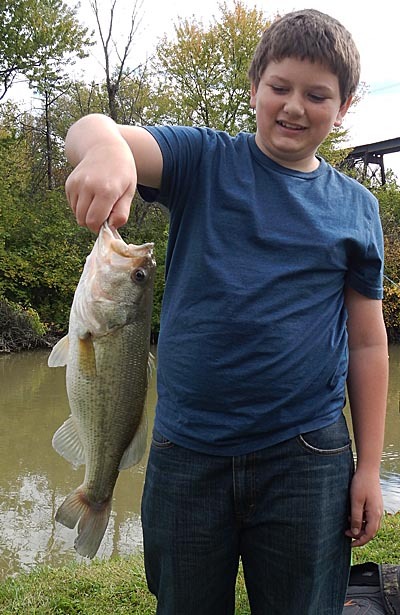 Fishing a new location is always exciting, and today I got to do that while also participating in a very fun Cleveland Metroparks sponsored event with my son. 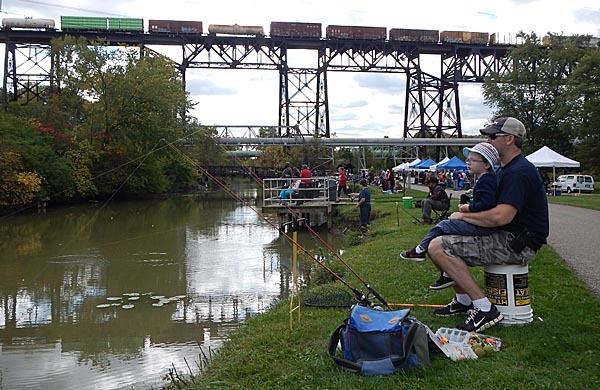 The event, “Fall Family Fishing Fest” took place at the Ohio & Erie Canal Reservation on E49th in Cuyahoga Heights, Ohio. 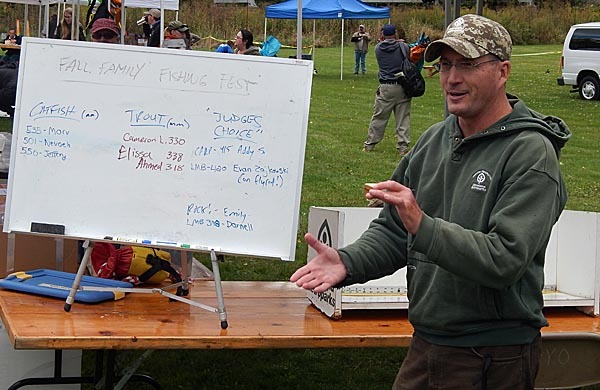 The main attraction for Bryce and I was the fishing derby which gave prizes for kids catching the top 3 lengths of Channel Catfish and Rainbow Trout (the species stocked specifically for the event). Additionally, there was a category for special catches outside of those two species which made it fun to see what resident fish might turn up. Along with the fishing, there were educational areas and programs offered that rewarded youths not only with knowledge – but a new fishing pole! Bryce had already participated in an event that gave him this reward, so we would opt out to ensure that another child would get one. The weather was perfect, hardly a trace of wind and plenty warm for an October day. The venue itself was neat due to its history (can read here) and was quite scenic. As with any Cleveland Metroparks event, their staff and volunteers always make it fun and enjoyable for all participants. I’m impressed that even with hundreds of kids running around and all the chaos, there are countless examples of each kid getting personal attention and being made to feel special. Bryce and I set up a couple rods with jigs tipped with waxworms in the hopes of enticing a trout to bite. I also thought this offering might have a bit of ‘universal appeal’ to other species. Taking a newly 4 year old fishing, I mostly just hoped to keep bites happening so he didn’t grow bored and end our day. The plan worked rather well and Bryce caught a decent catfish within minutes of our arrival. 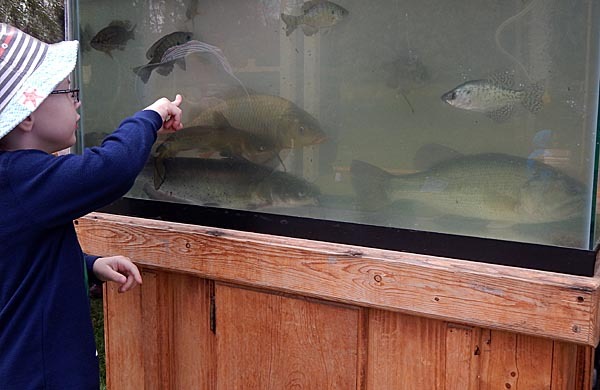 He was thrilled to watch his fish get measured, his name written on the leaderboard, and see his fish go into an onsite aquarium for the day. While the day would eventually see his name completely off the board, I had to laugh that he coped with this by saying he still was first because he caught the first one. It was also funny that people who asked him how long his catch was would get, “600 hundred and 27 hundred pounds”. Along with inheriting his dad’s love of fishing, he may have gotten my math skills. That’s a big fish bending the fly rod like that! The two photos above, were a story that just had to be told. I watched a boy not far from us get instructed on fly fishing and he proceeded to cast for hours. With that kind of persistence I was hoping he would be rewarded with a bite, and boy did it happen! I looked over and saw a huge bend in the rod and knew it was a substantial fish. After a spirited battle with the fish, it made it to the net. We all were a bit shocked to see a dandy Largemouth Bass. I venture to say there are many accomplished fly fisherman that haven’t caught a bass of that size. Congratulations to Evan, and I think it is safe to say he is hooked on fly fishing! 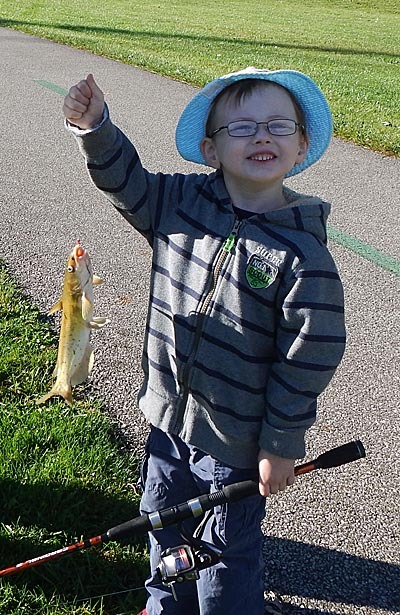 While maybe nothing quite as exciting as Evan’s catch, similar joyous moments of fishing success were playing out all along the canal. 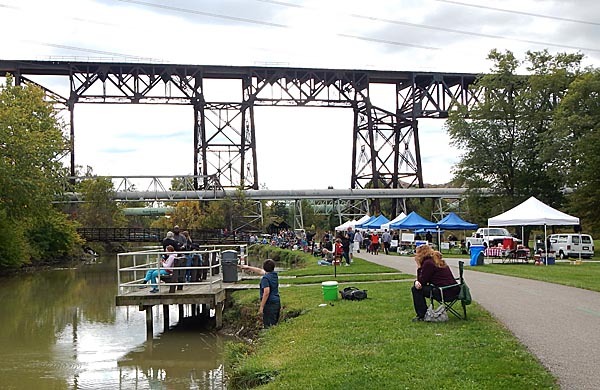 From first catches to special catches, big fish to little fish and everything in between, yes even a rock that was caught – people of all ages were having a good time. These events are amazing in the life long memories they create and the way it instills an appreciation of nature for the kids participating. The day ended with awards being distributed to the kids that had the top catches. Many arms and hands were holding some serious fishing swag, prompting a lot of smiling faces. I heard a lot of fishing stories being exchanged, including a few of the ‘ones that got away’. Even with a few lost fish it seemed everyone had some level of success. 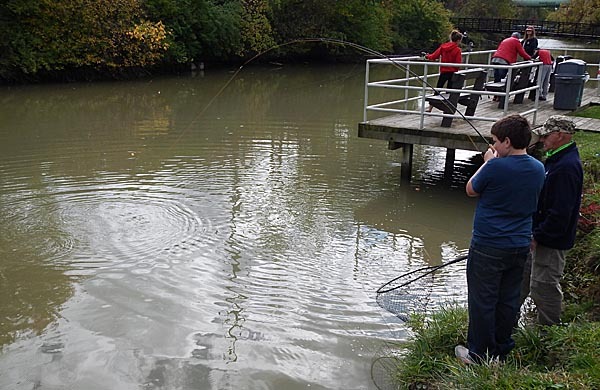 The metroparks staff and volunteers were largely responsible for why this was the case by offering equipment for loan, some free equipment, free bait, and some expert fishing guidance. Folks even canvassed the fishing area with long handled nets indicating to me that every detail had been well thought out. If you missed this event, make sure you don’t miss the next. 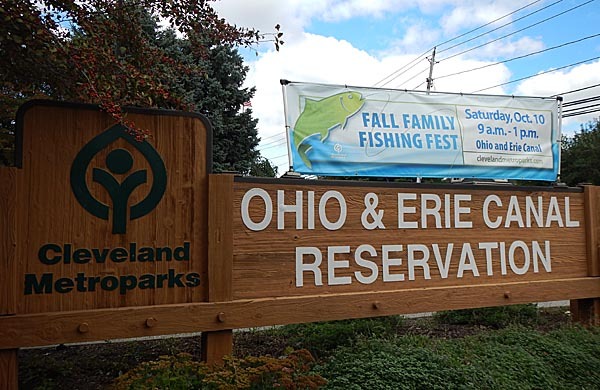 I would like to personally extend a big thank you to the Cleveland Metroparks and the volunteers for providing such a fun day for my son and I.
Adam, It was nice to meet you and Bryce at the Metroparks Fall Fishing Fest last Saturday. Your Photos and comments about the event are great. You really captured the event beautifully. P.S I love your website. You have a great perspective on the sport of fishing. Thanks Howard, and thank you for volunteering with the Cleveland Metroparks! I’m glad you like this site, I always appreciate feedback! It was nice to meet you as well and I hope to see you again soon.